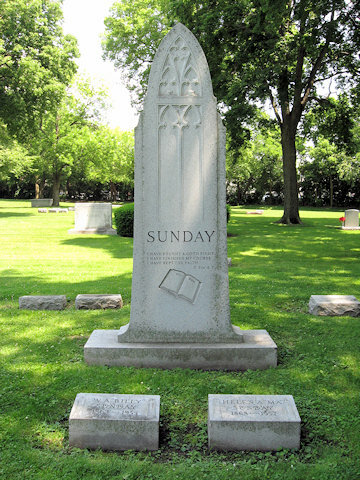 Forest Home Cemetery, Forest Park, Illinois, U.S.A.
Billy Sunday (1862-1935) was an American evangelist born in Iowa. A professional baseball player in the National League, he was saved in 1886. Associated with J. Wilbur Chapman from 1893 to 1895. 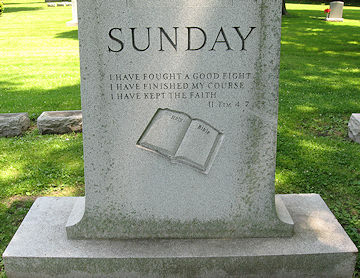 An evangelist from 1896 to 1935, he made an attack on liquor the mainstay of his campaigns. 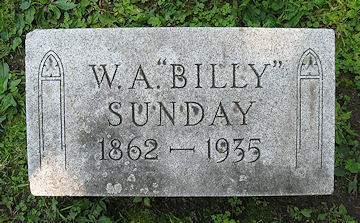 Marker for William "Billy" Sunday. 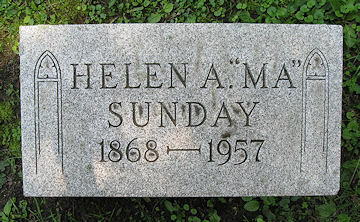 Marker for Helen "Ma" Sunday. 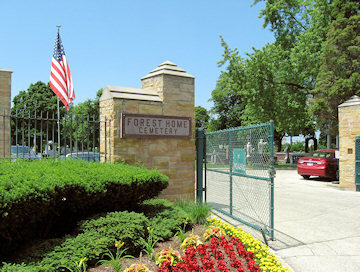 Forest Home Cemetery main gate entrance on Des Plaines Avenue. Gates open on Sunday at 8:30 a.m., Bridge and West gate close at 4:00 p.m.
Gravesite is Section 32, Lot 106. Photographs by Stephen & Dorothy Ross for WholesomeWords.org 2014.